Stacey This table is sooo cute. My sister said it's the most beautiful little table and chairs she's ever seen. It's very sturdy and high quality. 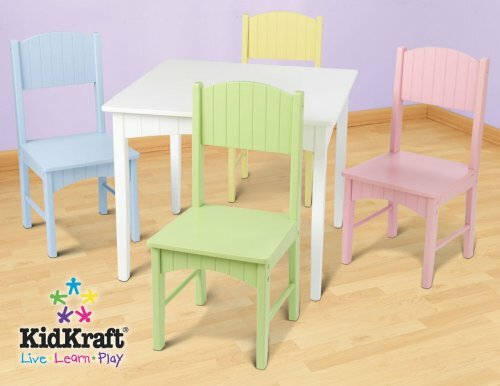 It's a great value, considering most sets only come with 2 chairs. 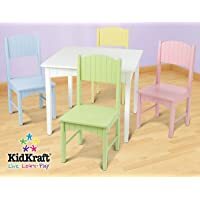 At least 4 kids can sit at this table...and 3 can squeeze on the bench if they need to! My 27 month old gets on and off by herself, no problems, and is very excited that her feet can touch the ground. Her 6 year old cousin was very comfortable sitting at he table also. The only down side is that the white shows any stray crayon marks and scratches pretty easily. But - hey - it's a kid's table. Certain products will get the crayon marks off. Very happy with this purchase! jane's mom my 2 1/2 year old loves this table set, but the bench is her favorite! we do all of our art projects here and it works out very well. it was definitely worth the wait - we ordered for valentine's day and didn't receive until summer! (manufacturer's fault, certainly not one step ahead/leaps n bounds) would recommend to everyone! Susan My husband put this together quickly and was amazed that every hole lined up perfectly!! It arrived just as promised.